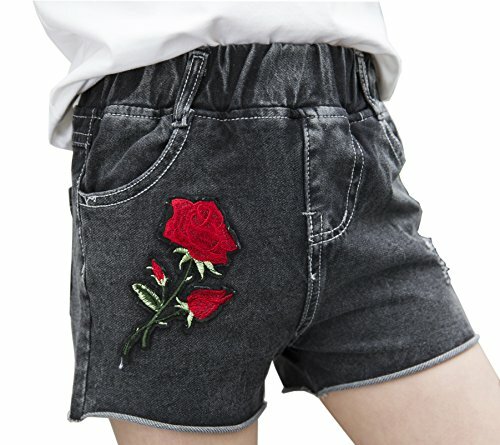 We've got your sunny-day style covered with our Middle-Waisted Black Wash Floral Denim Shorty Shorts! They flaunt fabulous on-trend deets that really catch the eye, like a cool wash, frayed hems and big, bold rose floral embroidery. Slightly stretchy fabric ensures a perfect, curve-hugging fit. Your warm-weather look is so on point when you rock our Embroidered Chambray Shorts with a coordinating tank or tee! These breezy bottoms boast a relaxed cut for supreme comfort and pretty floral embroidery above the scalloped hems. Stretchy waistband. 4-5 Years/ Little Kids (Tag Size 120 cm): Shorts Length:9.2".---Hip:27".---Height:45"
6-7 Years/ Little Kids (Tag Size 130 cm): Shorts Length:9.7".---Hip:28.7".---Height:49"
7-8 Years/ Big Kids (Tag Size 140 cm): Shorts Length:10.2".---Hip:30.3".---Height:53"
9-10 Years/ Big Kids (Tag Size 150 cm): Shorts Length:10.7".---Hip:31.8".---Height:57"
11-12 Years/ Big Kids (Tag Size 160 cm): Shorts Length:11.2".---Hip:33.4".---Height:61"
It's all eyes on your baby when she strut into the room rocking our Rose Embroidered Cut-Out Middle-Waisted Denim Shorty Shorts! This perfect pair boasts bold embroidery on the front, with ripped in the design that show off the pocket bags beneath. They also feature 5 pockets and more subtle details, like whiskering and frayed hems. Their soft, stretchy fabric is splashed in a dark wash with the perfect amount of fading; Slightly curled hems complete this must-have style. The Dark Wash ensures they'll look amazing with everything from funky graphic tees to pretty off-the-shoulder tops. Your princess will look like you belong on Hollywood Boulevard in our chic Midi Shorts! Perfect for any up-and-coming fashion icon. Flaunt 'em with her sassiest top and cat-eye shades.